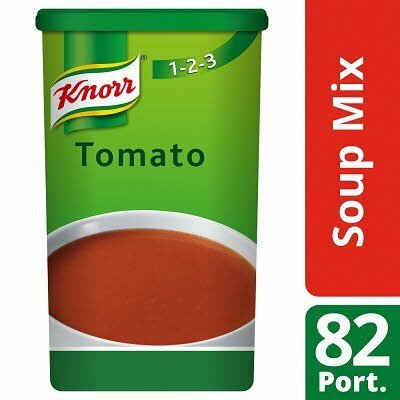 Tomato puree powder * (30%), sugar, modified corn starch, WHEAT flour, palm fat, salt, flavour enhancer (monosodium glutamate), potassium chloride, onion powder, yeast extract, spices (garlic, pepper, turmeric), maltodextrin, pea starch, fructose, colour (paprika extract), soya sauce (SOYBEANS, WHEAT), citric acid, flavourings. *made from sustainably grown tomatoes.May contain milk, egg and celery. Preparation for 1 litre: 1. Ensure the product is well mixed before weighing out. 2. Stir 79g of soup mix into 1 litre of boiling water. 3. Bring soup back to the boil. 4. Simmer for approximately 4 minutes, stirring occasionally. 5. Unused prepared portions must be refrigerated and used within 24 hours. Store in a cool dry place. Reseal after use.